Three years ago while riding with another trainer, I met Sherry. At the time I had a 4 year old Thoroughbred in training and took lessons. Sherry would come to have an objective eye while she rode her most challenging Thoroughbred jumper. I was impressed with both her kindness and her level of training and riding, it had been years since I had seen such exquiste form and only at top levels. Her equitation was perfection and her calm thoughtful methods of correction were exceptional. At the time I wished I could change trainers but the distance to her beautiful barn was a challenge. Needless to say the time came when I could no longer avoid the right decision for both my horse and myself. Not only did she start Fia from the beginning but also she trained her slowly and carefully to come from behind moving through her shoulders with extension, balance, and calmness. 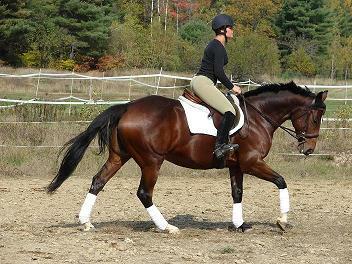 Sherry also took on the challenge of correcting many years of my riding faults and foaling out my mare. She excels at training horses, using natural horsemanship breaking (without stress), to turning out some of the best junior riders in the state. Her camps, lessons, and ground training exceeds all others. We are lucky to have this talented horsewoman with us. Copyright 2014 Burnt Meadow Stables. All rights reserved.